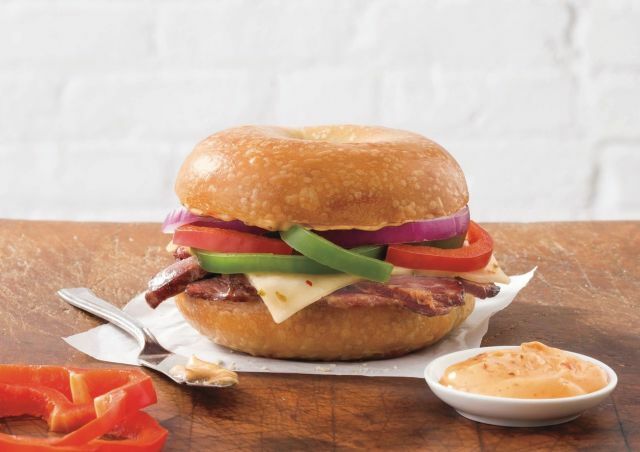 Besides the normal run of pumpkin menu items, Bruegger's Bagels is serving up the new Chipotle Brisket Melt as part of the 2017 fall menu at participating locations. - New Chipotle Brisket Melt - Sliced brisket, pepper jack cheese, red and green peppers, red onions, and chipotle mayo on a toasted plain bagel. - Smoky Brisket & Pastrami Egg Sandwich - Seasoned fresh-cracked egg, sliced brisket, sliced pastrami, cheddar cheese, and chipotle aioli on a toasted Everything Bagel.